Due to policy changes, overall claims for federal residential energy tax credits have declined in recent years, although some credits have grown in use. Examples include the $2,000 new energy-efficient home credit (45L), and the section 25D credit for installing power producing property in homes. This post will examine 25D and the third major credit (25C). Two of the major housing-related energy tax credits are known by their tax code sections. The section 25C credit offers a tax benefit for energy-efficient upgrades to existing homes. The section 25D program offers a 30% tax credit for installation of power producing equipment (solar panels, geothermal heat pumps, fuel cells and wind turbines) that are installed to new and existing homes. Combined claims of these credits have declined in recent years. According to NAHB analysis of IRS data (available through tax year 2012), total claims of these two credits summed to $5.8 billion in 2009 and rose to $6.1 billion in 2010, before falling to $1.7 billion in 2011 and finally to $1.3 billion in 2012. By count of taxpayers, a similar pattern can be seen. 6.7 million taxpayers claimed either one or both credits in 2009, rising to 7.2 million in 2010, before falling to 3.6 million in 2011 and 2.2 million in 2012. The reason for this significant decline is related to rule changes associated with the 25C credit. At the end of 2010, Congress extended the 25C program but reduced its value to a lifetime credit of $500. The 25C credit expired once again at the end of 2013, and Congress may extend it for another year as part of a “tax extenders” legislation now under consideration. Past history shows that for this credit to have the largest policy benefit, such an extension should be as long-term as possible, as retroactive extensions limit its reach. 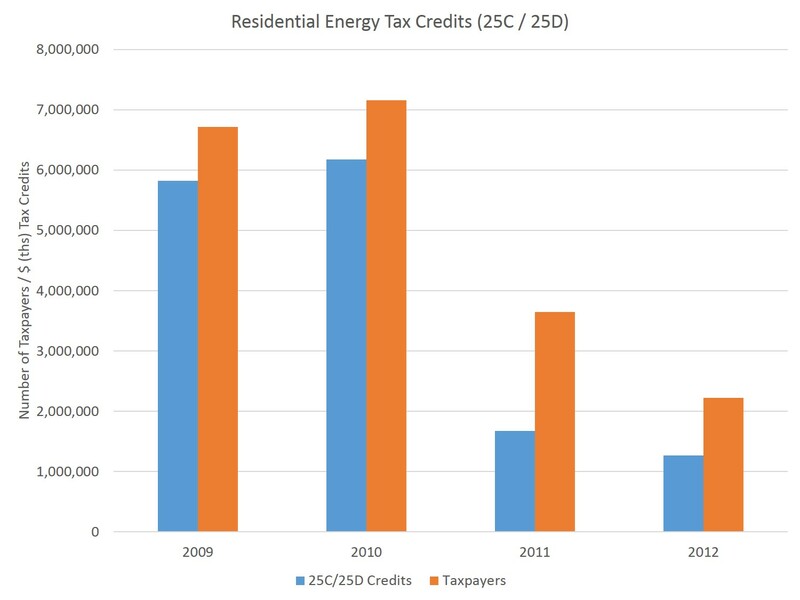 In contrast to 25C, 25D use has actually grown as overall residential energy tax credit claims have declined. In 2009, a total of $738 million of 25D claims were made on tax forms. That total grew to $800 million in 2010. And in 2011, claims of 25D totaled $921 million in tax credits (data breaking out 25C and 25D as separate programs for 2012 is not available yet). The 25D tax credit is scheduled to remain in law until the end of 2016. The combined IRS data point to another merit of the credit. Over the period of 2009 through 2012, more than 90% of all taxpayers claiming either credit had adjusted gross incomes (AGI) of less than $200,000 (93% for 2009 through 2011 and 91% in 2012). Overall, the data indicate that while the numbers are now lower, millions of taxpayers would benefit from extension of the 25C credit for 2014 and going forward. And builders are well advised to consider the market benefits of incorporating 25D qualified property into new homes and remodeling projects.